The naive young narrator of Edgar Allen Poe's hallucinatory short story "The System of Doctor Tarr and Professor Fether" visits a French lunatic asylum and realizes only late in a grand banquet that the diners are the lunatics, dressed uneasily in the clothes of the staff. Something like that is evoked by Ashley Hall, the radical Scottish psychotherapist RD Laing's "safe haven" as shown in the film Mad to be Normal, where mental patients live in equality and amity with staff. Laing, whose books made him famous as a rock star in America and admired by college students on a par with Marx or Jefferson Airplane, argued that forms of so-called insanity were merely logical strategies for dealing with the insane conditions of the contemporary world. He forbade the use of tranquilizers or other prescription drugs at Ashley Hall but shared LSD with patients. Robert Mullan, who has made documentaries and features and written two books on Laing, provides an admiring, but also critical, picture of Laing but one that, due to limited budget and his inexperience as a director of feature films, comes off at times as as disappointingly patchy, with very limited treatment of Laing's theories. There are some good performances, beginning with a bold and sharp-edged one in the lead by David Tennant (of "Dr. Who" and Harry Potter). Tennant unleashes his native Scottish accent for the role, a heavier brogue than the actual Laing displays in filmed interviews. This movie RD Laing drinks, swears, and smokes up a storm, wears the signature paisley shirts, and attempts miracle cures that don't quite come off. Resident patients are well played by Gabriel Byrne and Michael Gambon; two others are well played by Jerome Holder and Olivia Poulet. An American grad student who becomes his girlfriend, Angie, is played with buoyancy and restrained glee by an excellent Elizabeth Moss, who puts us as much at ease here as she made us uncomfortable in Ruben Östlund's flashy but scattershot film The Square. However, these five good actors are all playing invented characters, and Ashley Hall seems underpopulated. Laing's son and biographer Adrian Laing was not amused. "'I don't recognise my father," he told BBC News after seeing the film. "The interior of Kingsley Hall bears no resemblance to its shambolic and faeces-strewn past," he added. He found the movie's finale a "cheap trick." A scene in an American institution shows the film's strengths and limitations. In it Tennant, as Laing, enters a padded cell to visit a young woman who's reportedly catatonic, won't speak, and has to be force-fed. Laing squats down beside her, undresses in imitation of her, smokes, chats, gives her an acupressure lesson, and gets her to whisper the name of her favorite pizza so they can order out: "pepperoni." Later the girl walks out of her cell with Laing, with the head of the hospital cursing his "unprofessional" behavior. It's not sure if this is any kind of victory. But it's still remarkable. And yet, something off in the staging and timing makes a sequence that ought to be spectacular wind up seeming a little anticlimactic. Mad to be Normal has one outstanding virtue: it makes one curious to learn more about RD Laing. And his son Adrian admitted he wasn't unbiased in his condemnation, because he's "in the development stage of a substantial RD Laing feature." That'll be another angle, at least. Mad to be Normal, 106 mins., had its premiere 26 Feb. 2017 in home territory of Glasgow, playing in seven other festivals, released and reviewed 6 Apr. 2017 in the UK. 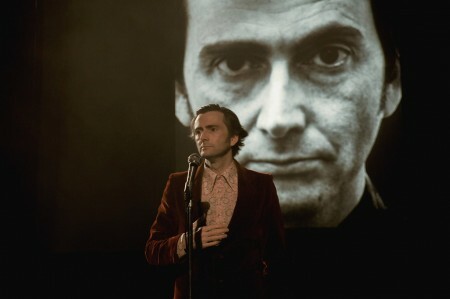 Peter Bradshaw of the Guardian called Tennant's performance "brilliant" and gave the movie four-out-of-five stars. There's a US theatrical debut 15 Feb. 2017 at opening night of the Mostly British Festival in San Francisco, and a US video premiere 16 Feb.